Undoubtedly Google Adsense is a mainstream source of income for most bloggers and site owners. Adsense is a successful contextual advertising network and delivering ads to publishers since 2003. Every blogger on this planet knows how difficult is to get an approved Google Adsense account these days. At the same time managing an Adsense account is also not an easy thing. I’ve come up with the following reasons why new bloggers should not blog for the sake of Adsense earnings. 1. Google is very strict when it comes to their Adsense program because they are more concerned about advertisers. They may ban you anytime without notice. Most of the times you couldn’t figure out the actual reasons behind it. 2. The CPC could be low if your site doesn’t attract decent traffic from US and Europe. 3. Adsense is a dream for newbies hailing from India and Pakistan. They have to wait for at least 6 months. But, of course it is not always true. 4. New bloggers upon reaching their threshold payout have to wait for PIN to arrive. It may take several weeks for verification. 5. Click bombing is a type of invalid clicks attack on the sites. Google takes it very seriously and may ban you permanently. So approved publishers must watch their Adsense reports and analytics on daily basis. However, if they found any unusual activity on their site they must report here. 6. Once banned from the program newbies couldn’t withdraw the estimated earnings. Being a publisher you can appeal to them but there are very rare cases where publishers got their Adsense account back. The Adsense support is extremely worse than many other ad networks. Sometimes you may feel that it doesn’t exist. 1. They assume that they can become millionaires with this program. In reality it is not the scenario. Google Adsense is not a get rich scheme. I agree that there are pro bloggers who are making 4 figures income per month. But, it didn’t happen overnight. You could probably ask them how did they workout for themselves. There is a lot of struggle and dedication behind their success. Once your work get noticed people would start visiting your blog. 2. 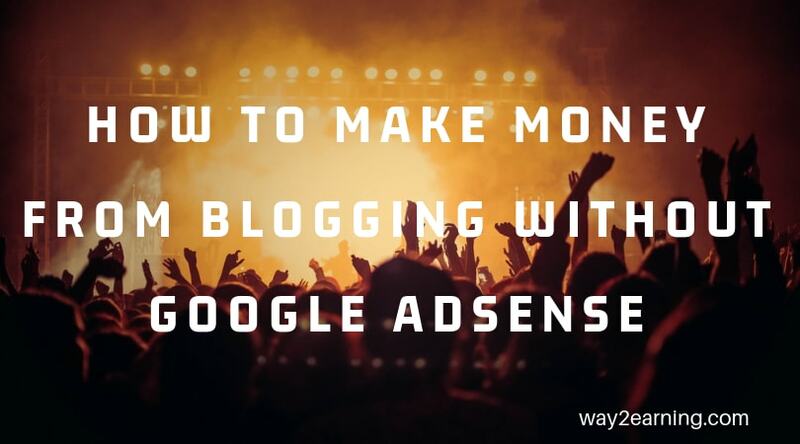 Some newbies start blogging to make money with Google Adsense. I recommend newbies not to start a blog for the sake of making money. Start a blog with the niche that you’re passionate about and try to help people with your informative and quality articles. Make your blog grow with your passion, skills and dedication. Content is the only mantra for any blog to get successful. Keep writing high quality content which is really useful to people. When your content gets noticed on social media and search engines people starts coming frequently to your blog. It is the engagement which could make your blog popular. When your blog gets adequate traffic and higher rankings you could try to monetize it. This is all about why bloggers should not blog for the sake of Adsense. If you like this post please do share with your friends. It’s a very smart post Suresh bro. Many newbies only comes to blogging to make money from adsense and they think that it’s a get quick rich scheme. I suggest all of the newbies to make something really valuable and make it go viral. Build community first only then you can start making some money with adsense. Thanks for reminding, its really important to write quality posts. If you write nonsense posts Google will kick you without knowing. Very nice Post. I Agree With You. If you have good traffic, advertisers would get attracted towards your blog and you can earn through advertising. very very informative , if number of visitors are low , can we get google adsense approval? Great Post suresh bro. Blogging for the sake of Adsense is almost waste for the newbies because if they do not get approved then it just ruins their interest from blogging. Blogging for money and adsense. This is very common honestly. Many bloggers doesn’t see the fact for that and most of the time, ended up ‘losing’ more than gaining. Personally, blog because you love it and slowly, traffic will pick up. Great Advice Suresh. Even I am new in the field of blogging and still waiting for the pin from the Adsense. Its really a difficult task and I do experience difficulties on getting more traffic and keep it growing or making it stable. Thanks Suresh for advising all the new bloggers. There is no doubt bloggers are working for money. But they must have patience and passion for it. They want to become rich overnight. But it is not possible. I hope this post give patience to bloggers. That was a beautiful article! This is cheating many of google adsense publishers are banned and google doesn’t tell them the reasons. But I checked that most of the traffic comes to their sites from proxy servers. Yes i agree with you Suresh but not fully that if anyone is starting his or her blog for adsense than he should not work any more… but if someone is blogging for sake of his passion and his love than he will be succeed in his goal and ultimately he will start earning….